Located on the banks of the Musi river, the historical city of Hyderabad is the capital of Telangana. In spite of its Nawabi culture, delicious cuisine of Hyderabadi Biryani, iconic Charminar and Golconda Fort, tempting bazaars and a lot more, the monotonous city life can still take its toll. 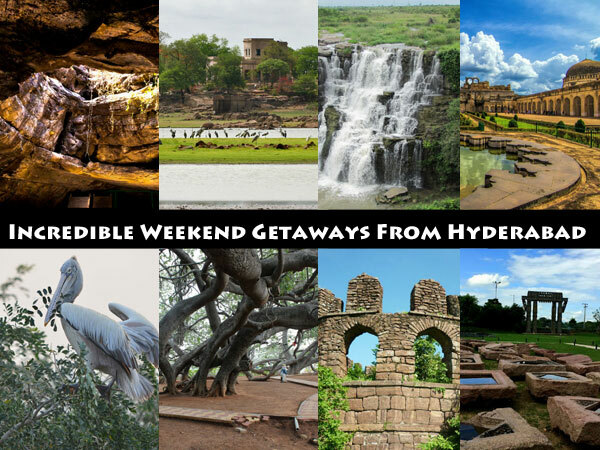 So take a refreshing break this weekend to break away from the hustle-bustle of Hyderabad and escape to one these amazing weekend getaways with your special ones. Or embark on an adventurous journey with your daredevil friends or go solo to experience some tranquility. Mahbubnagar is the largest district in Telangana, in terms of the area covered, and was named after the 6th Nizam of Hyderabad - Mir Mahbub Ali. Mahbubnagar is one of the most popular weekend getaway from Hyderabad. The popular attractions to visit and explore in Mahbubnagar include Pillalamarri, Kollapur, Somasila, Jurala Dam, Koilkonda and Gadwal Fort and more. There are so many offbeat, unexplored and less-explored destinations near Hyderabad that it is truly a traveller's delight. Nalgonda is one such offbeat place where you can plan a trip over a weekend and get completely into the explorer's mode. Especially if you are interested in history, then there are numerous sites like the Rachakonda & Bhongir Forts to explore, There are numerous temples, ancient Buddhist sites, waterfalls like Ethipothala & Bheemuni Padam, and even a mythological museum. Located at the border of Telangana and Maharashtra, Bidar is a famous city and a favourite getaway for history enthusiasts. Geographically, the city is located in the north-eastern part of Karnataka & is a hilltop city, and therefore, referred to as the "crown of the state". Bidar is a treasure trove and a must-visit for every history lover ever with numerous heritage and archaeological sites. Visit the famous Bidar Fort (where some scenes of the Bollywood movie ‘Dirty Picture' were shot), Narasimha Jhira Cave Temple, Bahamani Tombs, and more. The legendary city of Warangal located in Telangana, was the former capital of the Kakatiya dynasty between the 12th & 14th century. So you can imagine how culturally & historically rich the place must be. The magnificent monuments dotted along the region, including the incredible Warangal Fort, Thousand Pillared Temple amongst many others, most in ruins though but are a must visit for every art, architecture, history and photography enthusiast. Nagarjuna Sagar is one of the most popular weekend getaways from Hyderabad, especially during the monsoons when the beauty of the place is a sight to behold. Located in the Nalgonda district of Telangana, Nagarjuna Sagar is one of the world's tallest and largest dams and is built across the Krishna river. History lovers can also take a boat ride to witness an ancient Buddhist site and ruins located on an island in the Krishna river not too far from here. One of the fastest growing cities in Telangana, Karimnagar is a historic city situated on the banks of the Manair river. It is frequented by many history enthusiasts given its famous historical monuments, most of which are now in ruins yet manage to attract many visitors. One can take a tour through the impressive forts and temples, such as Elgandal fort, Ramagiri fort, Nagunur fort, Molangur fort, Jagtiyal fort, Kaleshwaram and Lakshmi Narasimha Temples, and more. You can also visit the Manair Dam when in Karimnagar. If you are bored to travelling to the touristy and popular places, then planning an offbeat visit to Nizamabad is a refreshing option. Like other cities & old towns of Telangana and Andhra Pradesh, this city too has a Nizam history, and those interested will find it exciting to unveil it with a visit to Nizamabad. Nizamabad Fort, Archaeological & Heritage museum, Ali Sagar Park, and Pocharam Wildlife Sanctuary are some of the places to visit here. The city of Khammam in Telangana is a treasure trove for history and archaeology enthusiast. A study has found that the Paleolithic man roamed around the regions of Khammam district in the prehistoric era. Several rock paintings, Megalithic Dolmens, and numerous other pieces of evidence prove this. Khammam Fort, Lakaram Lake, Kinnerasani Wildlife Sanctuary, archaeological sites of Nelakondapalli, are some of the places to explore when in Khammam. Often referred to as the gateway of Rayalaseema, Kurnool in Andhra Pradesh was the former capital of the state in the 1950s. It is blessed with rich historical and archaeological remains from bygone centuries. Prehistoric rock art and paintings from as far as 35-40,000 years ago, can be seen in some of the regions. Belum Caves is the most popular attraction, where relics from ancient times can be seen. Located in the Kurnool district of Andhra Pradesh, Srisailam is a famous pilgrimage centre as it houses the Mallikarjuna Shiva Temple - which is one of the 12 Jyotirlinga Shiva temples in the country. Apart from this, Srisailam has lot of interesting places for an explorer, visit the Akkamahadevi Caves, Srisailam dam, Srisailam Tiger Reserve, Nallamala Forests and more for an adventurous visit to the holy town of Srisailam. Kalaburagi, formerly known as Gulbarga, is one of the major cities of North Karnataka. The beautiful city is popular as one of the Sufi cities and is home to many famous religious monuments including the Buddha Vihar, Khwaja Banda Nawaz Dargah, Sharana Basaveshwara Temple, etc. Gulbarga also boasts the centuries-old Gulbarga Fort that was constructed during the Bahmani kingdom. Along with its several structures, incredible art and architecture, the Gulbarga Fort stores a canon which is believed to be the longest in the entire world. Though Mantralayam is largely popular as a religious place and a pilgrim destination, it certainly calls for a visit whether or not you are a religious person. Located on the banks of the Tungabhadra river, the place has a scenic beauty that has a peaceful and calm aura. The Raghavendra Swami Mutt is the iconic religious site that you could visit while in town. Serenely located on the banks of the Krishna river in the Andhra Pradesh, Vijayawada is one of the fast-rising cities. The city is recognized as a "Global city of the future" by one of the leading Business Magazine of the US. Vijayawada has a lot in store for the travellers from across the country and around the world. Do not miss visiting the Gandhi Hills, Kanaka Durga Temple and one the largest rivers island of Bhavani island, when in Vijayawada. Located in the Osmanabad district of Maharashtra, the town of Tuljapur is home to the famous temple of the goddess Tulja Bhavani. Goddess Bhavani was the deity of the Bhonsle clan to which the famous Maratha king, Chatrapati Shivaji Maharaj belonged. The ancient temple is a must-visit if you are someone who enjoys learning more about cultures and traditions as you travel. The city of Adilabad is located in the Indian state of Telangana. Given its abundant cultivation of cotton, the city is often referred to as the White Gold City. Ruled by several dynasties such as the Kakatiyas, Mauryas, Chalukyas etc., the place is a treasure trove for anyone who loves history. For those who don't, there are numerous enticing attractions such as Kuntala waterfall, Mavala Lake, Godavari river, and much more. Solapur in Maharashtra is one of the famous cities that lies on the road and rail route of Mumbai, Pune and Hyderabad. Famous for one too many things, including, but not limited to sugarcane factories, Solapuri chadars, cotton mills and power looms, Solapur is also home to the Great Indian Bustard Sanctuary. The Siddheshwar Temple and forts are other places of interest in Solapur. With a history dating back to the second century CE, the historical city of Eluru is located in the West Godavari district of Andhra Pradesh. This region of the state is known for its natural beauty, rich heritage, archaeological sites and more. Eluru is one of the largest cities here, and is known for its many Buddhist caves and archaeological sites. You cannot miss the 74 ft high Buddha statue that is installed in the heart of the city. Hampi is one of the most favoured tourist destinations, especially among World travellers, rock climbers and adventure enthusiasts. The place is also a haven for the shutterbugs and history enthusiasts. It really needs no introduction. Explore the town on cycles, sharpen your photography skills at the numerous stunning temples and ruins from the Vijayanagara empire, swim in the river Tungabhadra, go rock climbing or bouldering, or trek up the numerous cliffs surrounding this city lost in time. The lesser-known village of Gandikota nestled on the bank of the Pennar river in the Kadapa district of Andhra Pradesh is home to a historical fort and a gorgeous canyon which is famously known as the Grand Canyon of India. Not too far from here, is another place of interest - the Belum caves, known to be the largest and the longest cave system in India. Do plan a trip to these places and you would surely be back with some stunning pictures as well as memories. If you are someone who is interested in history and art, then a visit to the UNESCO World Heritage site of Pattadakal in Karnataka will leave you speechless with its eclectic beauty. The intricately designed and constructed temples here date back to the 7th and 8th centuries and showcase the fine work of the artisans from the Chalukyan period. The destination is also amazing for those interested in photography and exploration, etc. Formerly known as Vatapi, the touristy town of Badami in the Bagalkot district of Karnataka was the regal capital of the Badami Chalukyas, once upon a time. Today it is popular amongst the travellers, rock climbers, photographers and all alike given its stunning cave temples carved out of the numerous sandstone cliffs the place is blessed with. The beauty of the place is worth experiencing at least once in a lifetime. Blended in cultural and spiritual beliefs, the tiny town of Puttaparthi in the Anantapur district of Andhra Pradesh is surprisingly one of the famous pilgrim destinations around the region. It is home to Sri Sathya Sai Prashanti Nilayam - the abode of the popular spiritual Guru Sri Sathya Sai. Even if you arenot a religious person, there's plenty of natural beauty that you indulge in as the town is located on the banks of the river Chitravathi and is surrounded by undulating hills. If you want to experience the unspoilt and rich beauty of the East Godavari district in Andhra Pradesh, then you must plan a visit to the charming destinations of Maredumilli and Rampachodavaram. Quite offbeat, you are sure to have one of the most memorable travel experience in these places. Right from the untouched forests to glorious waterfalls, the landscape is sure to be etched to your mind forever. Settled on the banks of the river Godavari and home to the centuries-old Bhadrachalam Temple, the town of Bhadrachalam in the state of Telangana is one of most revered Hindu pilgrimage sites. Dedicated to Lord Rama - the protagonist of the epic Ramayana, the temple is believed to date back to the 17th century. Another major attraction here is the majestic Papikondalu Hills. Boat rides on the Godavari to reach the hills with thick forests, camping with most stunning views ever, are some of the most exciting experiences you will ever have.